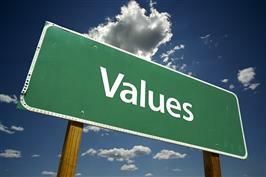 Values are not about how "good" you are. They're a statement about what's most important to you and about what makes you unique. We all value money differently, too. Some of us use money to indulge ourselves, some use it for security, and some aren’t really concerned about it. Regardless of what they are, there are no right or wrong money values. It’s simply our feelings that guide our goals and decision making. Click Money Values to access the worksheet that can help you to understand how you feel about money and the impact on the spending decisions you make. Keep in mind that your money values may not be the same as your spouse, partner, or a person affected by a financial decision that you make. Have that person complete the worksheets too! Once you know your money values, the key is to work with vs. against them when making financial decisions. For example, if having high-end, brand name clothing is important to you, seek out alternatives like consignment shops or thrift stores. If retail therapy is your thing, avoid taking roads that take you near the mall to help resist temptation; plan for purchases and trips to the mall. If your need to save as much as you can differs from that of your spouse, discuss a reasonable cash reserve and set financial goals that you both can agree upon. Click on Steps to Effective Money Decisions to help guide the discussion and decision-making process.